Adam has been an amazing addition to the Walter’s family, and bring a certain joy to the dealership. Adam comes to the organization with many years of automotive experience, and the education of a UTI certified technician. His amazing skillset in combination with his spectacular personality make him one the best people you could ever do business with. He hopes that one day his hard work will land him in a Mercedes-Benz E 63 AMG® Wagon. When Adam needs to escape the busy work life he enjoys taking a relaxing day fishing in the Sierra Nevada’s. There is nothing quite like laying back for a relaxing day of fishing and enjoying nature from his point of view. Adam also loves to take his wife out for date night whenever possible, and truly values his relationships and family. 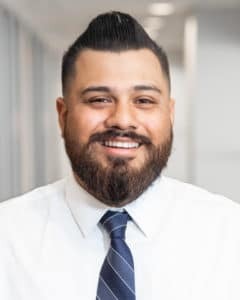 To do business with a person who will truly brighten your day, then look no further than Adam Garcia at Walter's Mercedes-Benz of Riverside.